Easy Pumpkin Fudge | The Perfect Holiday Dessert! This is our first fudge recipe and Matt knocked it out of the park with this Easy Pumpkin Fudge! It's easy to make, requires no baking and has the perfect soft, cheesecake consistency, except it's fudge! Fall time requires pumpkin everything so we went heavy handed with this recipe. The base of course has pumpkin puree and pumpkin pie spice, but we also crush up pumpkin seeds for a crunchy topping. The mouth feels are out of this world, and if you don't believe us you'll just have to make it this holiday season. No bake recipes are the easiest recipes, especially when there is a ton of other things to cook. You can usually make no bake recipes in advance to make your day of cooking less stress free! This is definitely our favorite no bake recipe by far because fudge + pumpkin + heaven! We have a couple other great no bake recipes that would be good to keep in your back pocket in times of need and high stress! Our no bake cheesecake and low carb truffles have both been hits among those who have made them. Our Favorite Easy Pumpkin Recipes! Pumpkin cookies, pumpkin pies, pumpkin loafs, fudge and lattes! We've got it all for you. Whether or not you let your pumpkin lover show, we all have it deep down inside of us. Come fall time, the pumpkin cravings going into overdrive. My personal favorite is our low carb pumpkin pie cheesecake, while I know Matt is obsessed with our pumpkin pinwheels! Honestly, you can't go wrong with any of our pumpkin recipes, especially our keto pumpkin bread! What makes this recipe the best of all our pumpkin recipes is how indulgent and rich this one is. It is more than worthy of your Thanksgiving or Christmas dinner this year, and 12 pieces might not be enough to satisfy everyone! 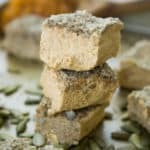 You can never have enough food when family and friends gather so make this easy pumpkin fudge ahead of time, set it out after dinner and watch it disappear! Recipe can be quickly added to MyFitnessPal - Search "KetoConnect - Easy Pumpkin Fudge"
Add the cream cheese and butter to a bowl and cream together using a hand mixer. Add the remaining ingredients and mix until fully combined. Line a 4x4 baking dish with parchment paper and pour the fudge contents into the dish. Spread it out to create an even top. If desired, top the fudge with crushed or ground pumpkin seeds. Press the seeds into the fudge and place in the fridge for at least 8 hours, preferably overnight. Slice into 12 pieces and enjoy!